Lavera Basis Sensitiv Vegan Q10 Anti-Wrinkle Day Cream tones your skin with its suppleness and elasticity. Skin is subject to the natural aging process: wrinkles appear and your skin begins to dehydrate. To remedy this, Lavera Anti-Wrinkle Day Cream is developed from a natural Q10 anti-aging active ingredient that stimulates the regeneration of skin cells while protecting them. Its richness of aloe vera and jojoba oil provides the moisture your skin needs. The Lavera Basis Sensitiv Vegan Q10 Anti-Wrinkle Day Cream is ideal for mature skin looking for both a moisturizer & natural anti-aging! In the morning, apply your Q10 Anti-Wrinkle Day Cream to the face with gentle circular massage for better penetration. For even more results, take care of your eyes with Lavera Q10 Anti-Wrinkle Bio Eye Contour ! 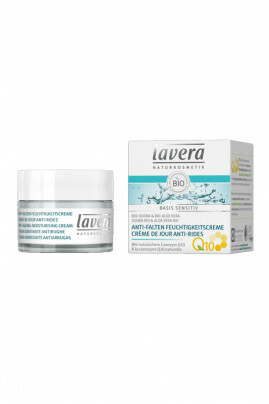 Lavera Basis Sensitiv Vegan Q10 Anti-Wrinkle Day Cream has a natural composition !